Rural Texas Judge Runs Busiest Patent Court in U.S.
Rodney Gilstrap has earned the title of busiest patent judge in the country. He has handled more than 4,000 patent infringement lawsuits since becoming a judge with the U.S. District Court for the Eastern District of Texas in 2011. Gilstrap was assigned more than 20 percent of all patent cases filed in U.S. federal district courts in 2016, according to Bloomberg Law data. No other judge even came close. It’s a challenging job, Gilstrap told Bloomberg BNA, but he keeps the cases moving with clockwork-like precision and procedures designed to promote efficiency and predictability. Those same rules that help keep the mountain of patent infringement cases manageable have drawn fire from some critics as the reason the rural district has such an over-sized patent docket. They say the court has gained a reputation as a rocket docket that favors patent owners and forces quick settlements. Gilstrap categorically denies that his court favors one side over the other. “The data just doesn’t bear that out,” Gilstrap said. The Eastern District’s record in patent cases is in line with the national average of wins and losses by plaintiffs and defendants, he told Bloomberg BNA. Whatever the reason for the court’s popularity as a patent litigation venue, Gilstrap’s workload could lighten if the U.S. Supreme Court decides to limit choices for where patent owners can file infringement lawsuits. The Supreme Court is scheduled to rule on TC Heartland LLC v. Kraft Food Brands Group LLC by the end of its term in June. The case will decide whether patent owners can continue to file infringement complaints in any federal district court where defendants sell their products. T C Heartland is being closely watched, as the high court’s much-anticipated decision could change the dominance of the Texas patent court even though the question in the case is arguably a narrow one: whether a suit filed in Delaware can be moved to Indiana. The Eastern District received more than a third of U.S. patent cases filed in 2016, according to Bloomberg Law data. The percentage was even higher in 2015, when the Eastern District heard more than 40 percent of the nation’s patent infringement cases. A study by Colleen V. Chien of Santa Clara University School of Law and Michael Risch of Villanova University Charles Widger School of Law showed that, if the Supreme Court agrees with TC Heartland’s position, patent complaints in the Eastern District would drop to about 15 percent of the total filed in the US. Gilstrap declined to comment on the Heartland case or what a decision in favor of Heartland might mean for the Eastern District of Texas. As the number of cases filed in the Eastern District climbed, and backlash over abusive practices by patent licensing companies, disparagingly called patent trolls, increased, so did the criticism of the court. Gilstrap said he wondered if criticism aimed at the court had less to do with a perception of the court’s favoritism of plaintiffs in patent infringement cases and more to do with critics’ bias against its location in a rural town. Marshall, Tex. is located in the northeast corner of the state, about 150 miles east of Dallas and 40 miles west of Shreveport, La., with a population slightly more than 23,000 people. He questioned whether the court’s volume of patent cases would be as much of an issue if it were located in an urban area instead of a rural town. Other courts have concentrations of cases, such as securities litigation in New York City or admiralty matters in New Orleans, but those are urban areas, Gilstrap said. “I think our courts are as able and as experienced as those in urban areas, our jurors are as dedicated and hard working,” Gilstrap said. Former President Barack Obama in 2011 appointed Gilstrap to a court that not only had a high volume of cases, but was also short staffed, Gilstrap said. 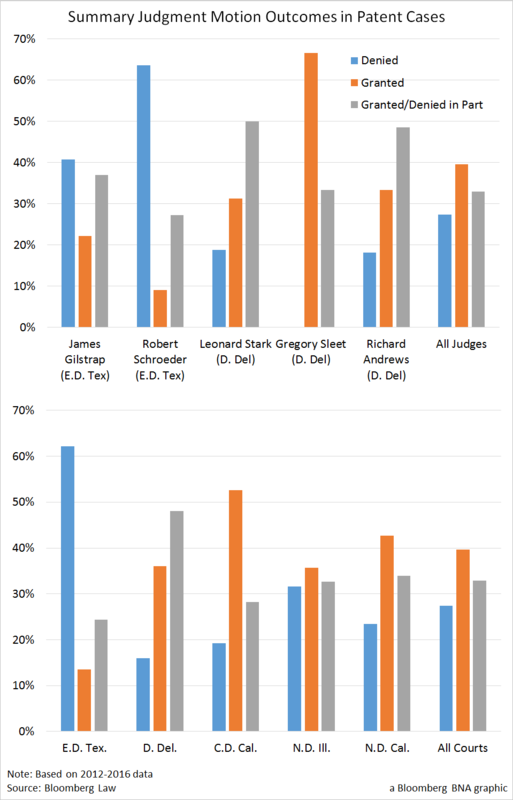 Three judges specializing in patents had retired, and the case load was consolidated around who was left—primarily Gilstrap. Case volumes surged after the America Invents Act, which stopped plaintiffs from adding unrelated defendants to the same infringement complaint, took effect the same year. In 2014, Gilstrap got some help when Judge Robert Schroeder joined the court. Gilstrap and Schroeder both preside over patent cases, but there are still three vacancies in the Eastern District. Schroeder’s office is in Texarkana, Tex. and he travels to all three courts in the district. Gilstrap is full time in Marshall, Tex. and therefore, presides over the majority of patent cases. Schroeder handles about half the volume of Gilstrap, according to Bloomberg Law data. Gilstrap pointed to a 10-year pilot program enacted by Congress in 2011 as one of the reasons for the Eastern District’s popularity as a patent venue. The program was meant to improve patent litigation outcomes by building the expertise of judges on patent law at 14 district courts. The goal of the program was to see whether designating specific judges to review patent cases—rather than randomly assigning the cases to all judges—would result in fewer reversals by the U.S. Court of Appeals for the Federal Circuit of patent claim construction decisions. The Eastern District was one of those courts. Another reason for the Eastern District’s attractiveness for patent infringement lawsuits is its culture of favoring trials over grants of summary judgment, Gilstrap said. The Eastern District had a tradition of favoring trials to resolve lawsuits, long before the patent docket existed, he said. If there is a material question of fact to be resolved in a case, judges usually won’t grant summary judgment. Gilstrap denied more than 40 percent of the requests he received for summary judgment in patent case from 2012 through 2016, according to Bloomberg Law data. On average, federal district court judges denied just under 30 percent of motions for summary judgment in patent cases for the same period. The Eastern District as a whole denied more than 60 percent of summary judgment motions in patent cases. Critics say the difficulty in getting summary judgment in the Eastern District and the greater likelihood cases will proceed to the more costly discovery phase mean defendants are more likely to settle, even if they face weak allegations. Gilstrap’s firm adherence to schedules and rules that he says are essential to keep cases on track are his trademark, attorneys told Bloomberg BNA. Gilstrap has a very predictable approach, Michael Smith, partner at Siebman, Burg, Phillips & Smith LLP’s Marshall office, told Bloomberg BNA. Smith represented both plaintiffs and defendants in Gilstrap’s court. Gilstrap is no-nonsense on discovery disputes, sets a firm trial date and doesn’t deviate. Lawyers know there’s a date to try the case or settle. “I don’t think he could manage his docket without that kind of strict adherence to trial dates,” Smith said. When Gilstrap practiced law in Marshall, he was a solo-practitioner, Smith said. No document left his office unless it was written just the way he wanted. As a judge, he expects the same attention to detail from the attorneys that appear before him. Gilstrap is a fair but very tough judge, Jean Vidal, with Ferraiuoli LLC, told Bloomberg BNA, who has been known to run cases like “clockwork.” The firm represents plaintiffs in patent cases. Gilstrap also requires attorneys to prepare notebooks for each juror in advance of the trial. In a patent case, the notebook will have a copy of the patent, pictures and names of witnesses, the disputed terms from the claim language construed during the Markman process, a chart that gives the disputed terms and the court’s adopted construction for those terms on a side by side ledger sheet for comparison. He also favors starting early in the day and ending late, thereby, spending fewer days on each trial. “At the end of day, I’m looking for anything that will streamline the process to avoid disruptions or confusion on the part of the jury,” Gilstrap said. His pretrial process includes requiring counsel to put forward all the exhibits planned for trial, and attorneys argue issues of admissibility before the jury is seated. “I know which exhibit are going to be pre-admitted, and they are going to be able to be used before the jury during the trial because they’ve already been before the court on admissibility issues,” Gilstrap said. The majority of the cases will settle before trial. There are only about eight to 10 patent trials in Marshall a year, Smith said. Smith has had 150 to 200 cases in Gilstrap’s court, but only three of those cases went to a verdict. Vidal has had at least 300 cases in the Eastern District since 2013, but none have gone to trial. For the cases that make it to trial, witnessing a well-argued case is one of perks of the job for Gilstrap. “Watching a skilled trial lawyer put on evidence, cross examine a witness, connect with a jury in an open courtroom is a wonderful thing to watch,” Gilstrap said.